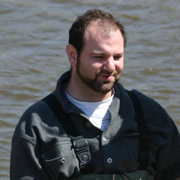 My research focuses on the population ecology of organisms living in flowing water ecosystems. Some of our current projects include: population genetic-based conservation plans for the blue land crab (Cardisoma guanhumi Latrielle) on Andros Island, The Bahamas, and the White Sands pupfish (Cyprinodon tularosa Miller and Echelle); using effective population size to understand bag limits for New York State (NYS) populations of river otters (Lontra canadensis (Schreber)); basic population genetics of carpenter bees (Xylocopa virginica L.) in NYS; and examining the interaction of urbanization and gene flow patterns in the saw-combed fishfly (Nigronia serricornis (Say)) and a golden stonefly (Acroneuria carolinensis (Banks)). My students and I couple field observations with population genetics to track migration, dispersal, and genetic bottlenecks. Although I am an entomologist by training, my current research program involves mammals, fish, and crustaceans, as well as insects, and I'm always interested in examining new organisms. Tami LaPilusa (M.S. 2012) - Genetic diversity of the blue land crab, Cardisoma guanhumi Latreille (Crustacea: Decapoda), on Andros Island, The Bahamas: Implications for sustainable management.